11. SJU is full of truly swell individuals. The community is so warm and welcoming, how could you not love us all? 10. YO, the class sizes. With the average class size of 23 students, it’s big enough that group discussions are always new and interesting, and small enough that your teacher will not only know your name, but feel comfortable saying hi to you on campus. 9. There are bees EVERYWHERE. Just kidding, that’s just the natural buzz of our campus. You can’t walk to class without seeing someone you know and sparking a conversation. It makes for a really upbeat, lighthearted campus. Seriously, there are minimal bees on Hawk Hill. 8. There are plenty of laughs to be had. The SJU Improv Team has gained quite the reputation since its creation in 2013. 7. Immortal birds of prey are the best type of birds. 6. You don’t have to worry about what to wear…EVER. Just wear your orientation shirt. Or your class of 201X t-shirt. Or one of the shirts you bought when you committed to Saint Joe’s. Or your SJU windbreaker! How about your black “Saint Joseph’s” hoodie? Anything will work. 5. We have more clubs than Ibiza. Accounting Society? Check. Ultimate Frisbee? Yep. Equestrian club? Got it. Greek life? Mhm. A Cappella groups? Duh. Russian club? For sure. Sign Language club? Obviously. 4. Our admission counselors, teachers, and administrators are hip with the Twitter. Sassy and hilarious responses from the Saint Joseph’s Twitter account are an all too common occurrence. 3. You know we’re the A-10 Champs again, right? It’s good to be back on top. 2. Hannah Montana was right. It’s the best of both worlds here: the city is a five minute train ride away, but campus is in a suburban area! 1. SJU is the most perfect home-away-from-home someone could ask for. The amazing Jimmy Wyatt is in his junior year and has his whole life ahead of him. 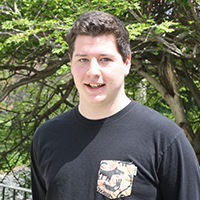 As an increasingly successful English major, Jimmy enjoys writing and just generally being creative. If he’s not writing insanely accurate listicles like this, you might catch him writing sketches, doing improv comedy, or just trying to make his friends giggle with some silly jokes.